Easily show the process of scientific problem solving. 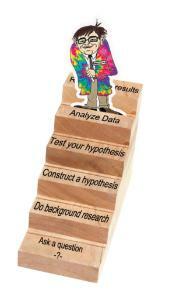 The scientific method is the step-by-step basis for all scientific research and development. The stairway will help to reinforce this key concept in a fun and memorable way. Help your students climb the stairs with “Professor SciQuest®” as they conduct experiments and learn the fundamentals of research, a key to all STEM-related activities.